Accueil Produits Bande originale La bande originale de “Le BGG – Le Bon Gros Géant”. La bande originale de “Le BGG – Le Bon Gros Géant”. Sortie : 1 juillet 2016. Film : Le BGG – Le Bon Gros Géant. 2. The Witching Hour – 4:41. 3. To Giant Country – 2:33. 4. Dream Country – 10:10. 5. Sophie’s Nightmare – 1:57. 6. Building Trust – 3:25. 8. Dream Jars – 3:30. 10. Blowing Dreams – 3:46. 11. Snorting and Sniffing – 2:13. 12. Sophie’s Future – 2:30. 13. There Was a Boy – 3:30. 14. The Queen’s Dream – 3:08. 15. The Boy’s Drawings – 3:05. 16. Meeting the Queen – 3:00. 17. Giants Netted – 2:03. 19. 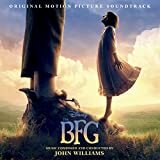 Sophie and the BFG – 8:09.